Sewage And Toilet Overflow | MA Restoration Inc. Probably one of the most disgusting situations a homeowner could face is dealing with a non-stop overflow of toilet water in the bathroom. It isn’t an everyday occurrence, but it is a common one for homeowners in general. Toilet overflows usually happen because of a clogged pipe. Maybe your toddler tried to flush something big down the toilet or put too much toilet paper in when flushing. Sometimes, a clogged pipe is clogged through no fault of your own. Whatever the case may be, having a toilet overflow sewage into your home is frustrating and nerve-wracking. If this situation happens to you, don’t waste any time trying to clean the mess on your own. M.A. Restoration in Westborough is your salvation when it comes to cleaning up any type of water damage in your home. The first thing to keep in mind when a toilet overflows in your bathroom is the type of water that is coming out. The water may be fresh toilet water that isn’t going to put your health at risk. BUT, the water could be contaminated with urine/feces and should be avoided at all costs. Professional water damage cleanup crews have the proper protective equipment and gear to clean up contaminated sewage water without posing a health risk to themselves or others. There is no reason you should attempt to clean up this type of water on your own and risk illness and/or death. Stay out of the affected areas until a professional arrives. Why Should I Rely On MA Restoration? M.A. Restoration isn’t just an average water damage cleanup company. They are certified and insured by the IICRC and have the experience and skill needed to properly clean up any type of water damage without posing a threat to your safety or the integrity of your home. Our team is compassionate and considerate at every job and work hard to make sure your personal belongings are salvaged as well as your home is. 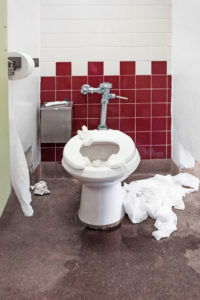 If you have experienced a sewage disaster from a toilet overflow, or any other type of water damage emergency, call M.A. Restoration immediately. Our team is standing by 24 hours a day so that we are there when you need us the most. Our mission is to bring peace of mind, comfort and happiness to every homeowner we work for – creating customers for life. Our goal is 100% satisfaction, every time.